Do you want to find out how much traffic a site gets? If so, you are on the right track. There are a bunch of traffic estimator tools out there. While there are so many of those only a few offers it for free. I am sharing with you two of my favourite website traffic estimation tools. Please note that these sites only show a rough estimation of the actual traffic. Alexa is one of the most popular web analytics company. Their web tool allows you to view website stats including page views, unique views,etc. 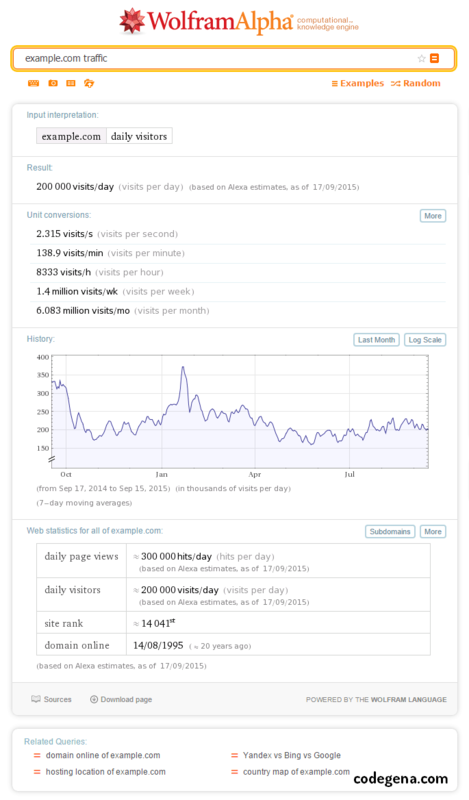 You can also see other informations such as time on site, global rank, linking sites, demographics, bounce rate,etc. To get started with Alexa go to Alexa.com and enter the site url at the top and hit enter. This is one of my favorite web tool. You may already know what Wolfram Alpha is, it’s a computational knowledge engine. You can use this tool to find out a site’s stats including daily web traffic, monthly traffic, subdomain traffic, comparing traffic etc. Below are some commands to use with wolfram alpha. Go to Wolfram Alpha and type in any of the below commands. Make sure to replace the url in the command to the one for which you need the stats. example.com subdomain traffic – This command returns a table showing the various subdomains of that site along with their percentage share in traffic. example.com vs google.com vs apple.com – A convenient way to compare website traffic againts others. You may also like: How to speed up my website? Please share this post with your friends and leave your comments below .